Negotiations continue between Theresa May’s crisis-ridden Conservative government and Northern Ireland’s far right Democratic Unionist Party (DUP) on terms for a formal coalition or a “confidence and supply” deal to pass key items of legislation. By the time of the May government’s Queen’s Speech, agreement remained only, in the words of the prime minister’s newly appointed deputy, Damian Green, “a possibility”—with the Tories resisting DUP demands for billions for Northern Ireland infrastructure and health spending, as well as increased arms spending. May seeking a governing relationship with the DUP’s 10 MPs is the only way she can form a majority government, but it is reckless in the extreme. 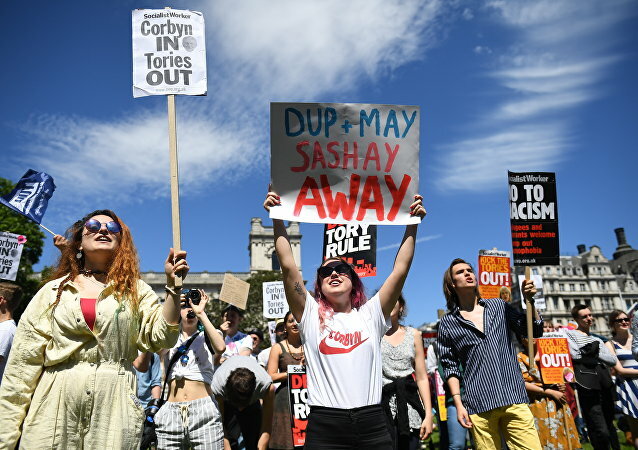 Aside from such official concern, a petition describing May’s collusion with the DUP as a “disgusting, desperate attempt to stay in power” and pointing to the DUP’s long association with loyalist paramilitary groups in Northern Ireland attracted over 750,000 signatures before being presented to 10 Downing Street. 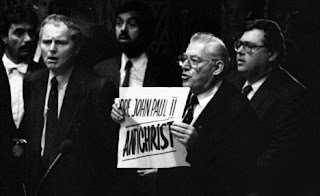 The DUP is indelibly associated with its founder and arch demagogue, the Reverend Ian Paisley. The Newsletter explained that Northern Ireland was in deep crisis, with the economic basis of the Northern Irish six-county state established through the partition of Ireland in 1921-22 coming under intense pressure. Partition was imposed by the wealthy Protestant Ulster based capitalists to defend their industrial interests from the revolutionary threat posed by the working class by carving off the industrial North and imposing sectarian divisions by pogrom and systematic religious discrimination against the Catholic minority. By the 1960s the large concentrations of industry around Belfast and Derry, resting on a highly organised but religiously polarised working class, were increasingly vulnerable to international competition. This expressed in a particularly acute form the bankrupt and outmoded character of much of British industry. The Northern Ireland premier, Terence O’Neill of the Ulster Unionist Party, sought to overcome the isolated character of industry by exploring links with the Catholic-dominated Republic of Ireland in the south, which was beginning to attract significant international investment. Paisley, speaking through his Protestant Telegraph, denounced O’Neill as a tool of the Vatican and mobilised support both among sections of the Protestant, particularly rural and middle-class layers of Protestant workers. Paisley, the Newsletter explained, found some measure of mass response because he put forward the most extreme version of the established system of prejudice and discrimination. The central purpose of the subsequent British deployment of tens of thousands of troops and the monstrous security/intelligence/spy apparatus was to head off this threat. This applies equally to the loyalist organisations and parties, who saw, and see, closer relations with Dublin as a threat to the middle class interests they represent. The DUP was founded in 1971 as an extension of Paisley’s Ulster Protestant Volunteers and the Free Presbyterian church. In 1973, the DUP was part of the Ulster Unionist Coalition (UUUC) set up to oppose the terms of the Sunningdale power sharing agreement between the British government, the leading unionist and nationalist parties in Northern Ireland and the Irish government. Throughout the decades of the “Troubles”, the party grew as the most consistent mouthpiece for loyalism. The DUP was the only one of Northern Ireland’s major parties which opposed the 1998 Good Friday Agreement. The agreement largely ended armed conflict in the North by laying the basis for Sinn Fein to join the Stormont Assembly, under complex sectarian power-sharing arrangements intended to create economic and political stability while still ensuring the continued religious division of the working class. Reflecting the long-standing loss of influence by the once powerful Ulster capitalists bound up with the destruction of heavy industry, the agreement amounted to a joint unionist and republican effort, overseen by the British and Irish governments, to attract global mobile investment. The agreement allowed the British Army to be largely removed from Northern Ireland and deployed internationally. The DUP denounced the agreement as a capitulation and betrayal to Rome and the IRA and set out to displace the Ulster Unionist Party (UUP), through being the most trenchantly sectarian party in Stormont. By 2005, the tactic paid off, when the DUP eclipsed the UUP as the largest unionist party. 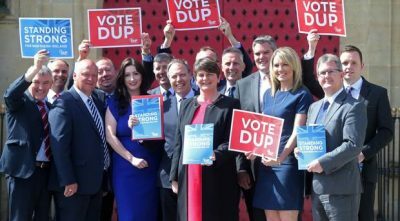 Having secured pole position, the DUP sought the most favourable terms under the St Andrews Agreement of 2006, orchestrated by the British and US governments. Paisley famously agreed to share government with Sinn Fein, in return for Sinn Fein offering full support to the Police Service of Northern Ireland, the former Royal Ulster Constabulary, while the IRA wound up their operations. The two parties entered power in Stormont in 2007 with Paisley and Sinn Fein’s late Martin McGuiness as respectively First and Deputy First ministers. Over the subsequent decade both parties happily collaborated in the imposition of the austerity demanded by capitalism against the working class, scrabbled to service the interests of the rival sections of the increasingly wealthy upper middle-class layers for whom they speak while carefully maintaining sectarian tensions. Peter Robinson replaced Paisley as First Minister until a succession of investment-related corruption scandals undermined support for him. His replacement was his close ally, Arlene Foster, currently First Minister of the suspended Northern Ireland Executive. The Northern Ireland Assembly is presently suspended ostensibly over Sinn Fein’s objections to the DUP’s role in a corruption scandal, but matters were in fact brought to a head over Brexit. Foster’s DUP campaigned for Brexit, Sinn Fein to Remain, and Northern Ireland voted by a substantial 56 to 44 percent to remain in the European Union. Despite its pro-Brexit position, the DUP is forced to recognise that Northern Ireland is one of the most exposed areas of Britain to economic fallout from leaving the European Union. Considerable press coverage has focused on the complexities of finding a means for Northern Ireland to leave the EU along with the rest of the UK, while avoiding a “hard border” between Northern Ireland and the Irish Republic. The border, established by partition and, during the Troubles, policed by hundreds of British troops and helicopters, is today almost invisible and traversed daily by thousands of travelers, commuters and truckers, reflecting the advanced state of the island’s economic integration. While all parties claim to want to avoid a “hard border,” no clear means has been established from this to be done while the line of partition is an external border of the EU. The DUP’s current policy, it seems, is simply to extract as much as possible from the British government to offset the economically catastrophic impact from Brexit, while maintaining Northern Ireland’s position in the UK. For Sinn Fein, Brexit has been seized on to push, with backing from both the Irish government and the EU itself, for a new “border poll” on Northern Ireland’s continued membership of the UK. The European Council, as part of an aggressive response to the UK, indicated that, were Northern Ireland to vote to rejoin the Irish Republic, it would be recognised as part of the EU. Neither option has the slightest progressive content and both contain the inevitability of some form of intensified sectarian conflict. The situation is fraught with dangers for the working class. As in the 1960s, but in far more advanced conditions, the key to workers advancing their own interests is the development of an independent and unified political movement in Ireland, North and South, seeking socialism in Ireland and Britain as a part of the United Socialist States of Europe.